On The First Day Of Winter Scientists At The Amundsen-Scott South Pole Station Watch What Film? 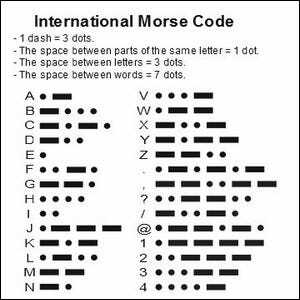 Morse Code, named after co-inventor and telegraph technology pioneer Samuel Morse, is the oldest electrical coding system still in use today. The code system, a series of short and long signals commonly referred to as dots and dashes, was first showcased in 1844. Samuel Morse sent a message, in Morse Code of course, to his partner Alfred Vail over a 38 mile cable between the Supreme Court building in Washington, DC and downtown Baltimore, MD. Since that first demonstration, Morse Code has been in continuous use in both civilian and military applications ranging from amateur radio communication to maritime communications. Although usage has declined significantly even those untrained in Morse code are familiar with the most famous of applications: sending out a distress signal. It’s possible to communication a Morse Code distress signal, SOS ( … – – – … ), with everything from blinks of light to blasts from a whistle.